"This recipe is easy and sure to impress." Place chicken breasts between two sheets of heavy plastic (resealable freezer bags work well) on a solid, level surface. Firmly pound the chicken with the smooth side of a meat mallet to a uniform thickness of 1 inch. Heat spinach in a saucepan over medium-high heat. Whisk eggs, Parmesan cheese, and milk together in a bowl. Stir egg mixture into the spinach; cook and stir until thickened, about 2 minutes. Remove from heat. Spread about 2 heaping tablespoonfuls of the spinach mixture onto each pounded chicken breast. Roll each breast into a cylinder shape, secure ends with toothpicks, and arrange on the prepared baking sheet. 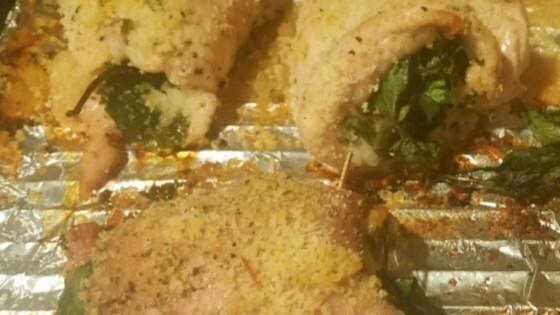 Sprinkle bread crumbs atop rolled chicken. Bake in the preheated oven until chicken is no longer pink in the center and juices run clear, about 45 minutes. Allow chicken to rest for several minutes before removing toothpicks and serving. We liked this recipe! I read a review that said it was a little dry, so after it had baked 25 minutes I drizzled 2 TB melted butter over the chicken. It came out perfect. extremely tasty. easy to make. This was delicious! I used fresh spinach instead of frozen and followed the advice of other reviewers and put the oven at 325 degrees. Chicken was done in half an hour. OK we LOVE Chef John! Recipe was good but of course, needed more seasoning. I did add more cheese to the spinach but otherwise. YUM!